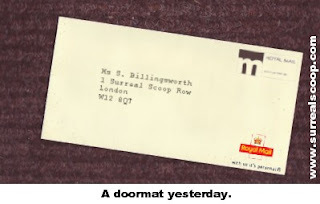 There were red faces at the Royal Mail’s headquarters on Monday when Sally Billingsworth arrived to take up her new job. "I had applied for the role of Lost Post Analyser," explained Ms Billingsworth. "I went through all the interviews, selection panels and aptitude tests but didn’t hear anything back. So I assumed that I must have got the job and just turned up." It seems that the rejection letter that Sally should have received had, ironically, been lost in the post, and thus at the start of last week there were two new Lost Post Analysers waiting to start their jobs. "Well, you know, here at the Royal Mail we are quite used to items of post going missing," explained Jane Stubbs, a HR Manager at the company’s Old Street Headquarters. "Although of course this is quite embarrassing it does highlight that we are focussing resources in the right area - that of reducing the number of items lost in the postal system." "Well, it has worked out OK for me, since they have now offered me the job that, apparently, they had rejected me for," said a beaming Ms Billingsworth. "This shows the value of one of the policies I will be instigating, that of increased use of recorded delivery. "Perhaps they should have sent me the letter by recorded delivery rather than a plain envelope with a hint of yellow in the colour and bearing a Royal Mail logo on the front and ‘with us it‘s personal‘ on the back. I could have easily mistaken that for junk mail. I assume. In addition they would know that I had received it, if I had. Which of course I didn’t."